To develop a storage tank design to resist stress and deformation due to the weight of the oil. The existing storage tank design was modified by providing additional cross support bars at the tank side walls, which provided structural strength and reduced the stress and deformation values considerably. Designing a storage tank requires taking into account diverse factors, in order to avoid premature failure. Out of the several loads the tank has to accommodate, the load acting due to weight of the fluid to be stored is of prime importance. The fluid weight also induces stress over the tank surface, resulting into deformation and ultimately increases the chances of tank failure. 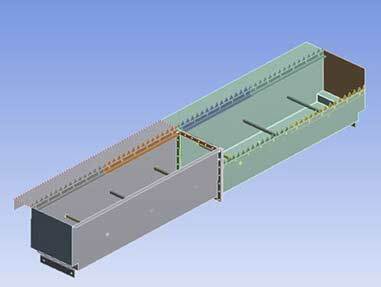 The client requested a similar solution for the storage tank designed to store oil. The major concern from the customer’s end was to re-develop the storage tank geometry, having the ability to withstand stress and minimize deformation values. The existing storage tank design was first analyzed to measure the stress and deformation values, considering the weight of the oil. Despite the stress values obtained were within the permissible range, the deformation was present and needed to be addressed. To minimize the deformation values, a new tank design was proposed, which included the application of additional support bars at the tank walls. 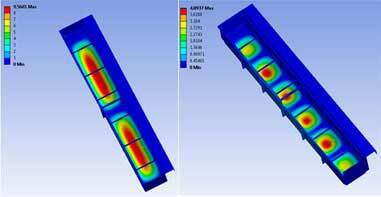 The additional support enhanced the storage tank strength with 45% reduction in deformation values.